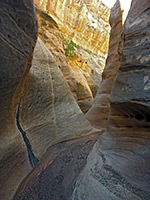 There are few slot canyons in Canyonlands National Park since the rock most conducive to their formation (Navajo sandstone) is exposed only in a few high elevation areas, in the Island in the Sky; across most of the park it is the Wingate, Moenkopi, White Rim and Cedar Mesa formations that are visible, and the ravines, although often sheer-sided, are relatively wide, bounded by cliffs, benches and ledges. 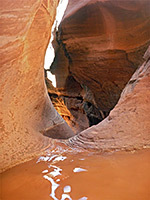 But short slots are sometimes found where seasonal streams start to cut down into particular layers, such as the White Rim sandstone, and one of the best known examples is the Holeman Slot near the lower end of Holeman Spring Canyon, shortly before the drainage joins the Green River opposite Valentine Bottom. A 40 foot dryfall at the end of the narrows prevents walking all the way to the river, but before this are about 600 feet of pretty, light-colored, medium depth passageways to explore, containing just a few minor obstacles. Topographic map of the Wilhite Trail and the Holeman Slot. 13 views of the Holeman Slot; gallery, slideshow. Scenes in the canyon (mp4; 0:58 min; 18 mb). The Holeman Slot begins immediately west of the point where the 4WD White Rim Road crosses Holeman Spring Canyon, so one way to arrive here is to drive or cycle, a trip of 35 miles starting along Mineral Bottom Road, which branches west off Hwy 313, six miles before the Canyonlands National Park boundary. 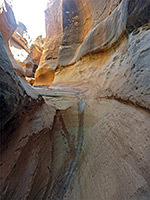 The other option is to hike the 5 mile Wilhite Trail, which also joins the White Rim Road right next to the slot. This path starts along the side road to Upheaval Dome, crosses to the edge of the Island in the Sky plateau, drops down the Wingate cliffs then follows a ravine to the White Rim; a walk of about 2 hours. The Holeman Slot starts beside the road, here running over a white slickrock plateau marked with many small potholes that hold water for some time after rainfall. The ravine deepens via a few drops of 2 to 3 feet, descending through crisp, light brown/orange rocks crossed with thin layers either lighter or darker in color, which add to the prettiness of the curving, water-carved canyon sides. 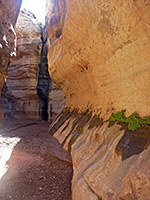 Shallow pools form in a few places after rainfall, and some parts of the floor may be covered by soft mud, but there are no significant obstacles until a slanting, two-stage drop of about 15 feet into a pool, at the start of the deepest and narrowest section of the canyon. This doesn't extend very far, however, soon opening out into a wider passageway with an entrance/exit route on the north side, followed by more shallow, twisting narrows that gradually deepen again until blocked by a chokestone above an overhanging drop. This is climbable, but a much bigger dryfall soon after marks the end of the slot, as the ravine opens out abruptly to a sheer-sided, 80 foot deep box canyon that winds its way westwards towards the Green River.